President Donald Trump's NAFTA plan once consisted of scrapping the trade deal completely. While on the campaign trail, he blamed it for the loss of American jobs to the advantage of Canada and Mexico. "NAFTA is the worst trade deal maybe ever signed anywhere, but certainly ever signed in this country," Trump said in a Sept. 26 debate against Hillary Clinton. That's the day several members of his administration warned the new president about the negative consequences withdrawing the United States from NAFTA could have. "Scrapping NAFTA would be a disastrously bad idea. It would hurt American families at the checkout, and it would cripple American producers in the field and the office," said Sen. Ben Sasse (R-NE) in a statement that morning, according to CNN. "It will devastate the economy in my state," Sen. John McCain (R-AZ) likewise cautioned. "I hope he doesn't do that." 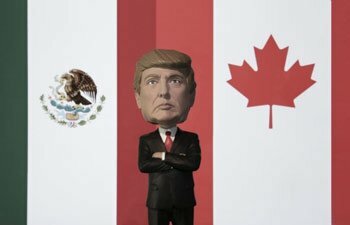 That evening, Trump changed course, opting to "renegotiate" NAFTA instead of withdrawing the United States from it completely. A new report released by the U.S. Chamber of Commerce on April 27 revealed millions of American jobs could still be caught in the crossfire. 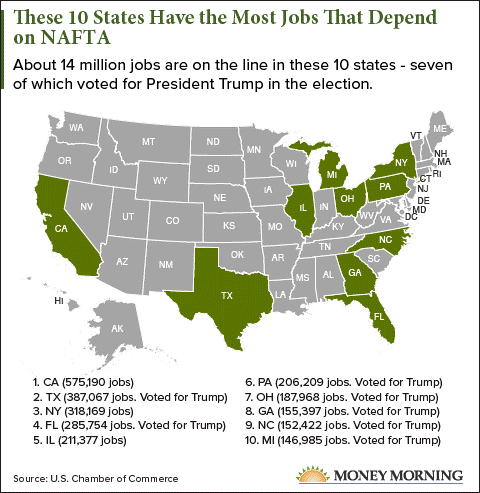 The U.S. Chamber of Commerce's study was the most comprehensive look at how many jobs in each U.S. state depend on trade with Mexico and Canada, reported CNN Money on April 27. The result: Some 14 million jobs are on the line. Even under renegotiated terms, the agency found that most of these jobs would be negatively impacted if actual "trade barriers" were to be erected under the new NAFTA renegotiations. "Trade barriers" are measures that governments introduce to make imported goods or services less competitive than locally produced goods and services. On top of trade barrier concerns, the study also revealed that the very manufacturing workers that helped propel Trump to his presidential victory would be heavily impacted by changes to NAFTA as well.